(1) It was hoped the train could use the direct chord from Marsh Barton to City Basin but, not surprisingly, didn’t. (2) Unit declared a failure (broken sidespring). 47134 & 13 coaches commandeered off 13:45 local to Paignton. 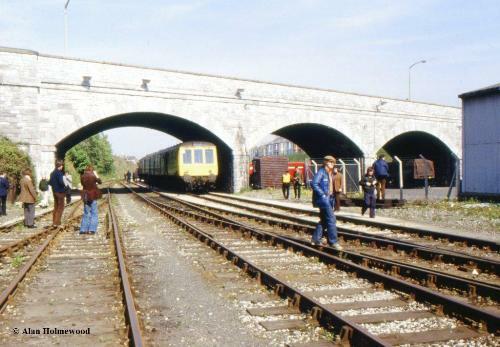 (3) The tour was scheduled to run from Laira Jn direct to Friary from Newton Abbot. (see also note 4 below). Train ran direct to Plymouth because of the need to change trains. (4) Shunter not available to allow the train to reverse at Laira Jn to run onto the main line back to Plymouth. The original route from Mount Gould Jn to Laira Jn had been severed not long before the date of the tour at the Laira Jn end to form dead end sidings for carriage stabling accessed from the Mount Gould Jn end of the Laira depot layout so was no longer available for the tour, necessitating use of the upgraded single line to the west of the depot known locally as the speedway. (5) Extra move in partial compensation for earlier diversion, (see note 3). (6) Stopped outside Newton Abbot on return to attend to a door not properly closed. (7) Timings shown are the 'Booked' timings with mileages being the 'actual mileages'. A loose insert with the ticket letter said "....slight timing adjustments from Taunton to the Exeter area, .... now leave Exeter St Davids at 11.49..."
(8) Via the Weston-super-Mare avoiding line. (9) Booked reversal point was Plymouth Friary. Bristol East Jn 10/07 10/07 ?